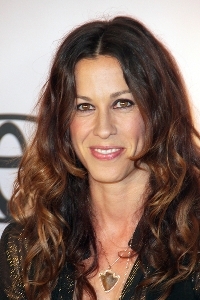 Alanis Morissette revealed the most intimate of details during an interview in US Weekly. The singer who made men cringe with her song You Oughta Know is pregnant. Alanis Morissette, 36, thought the perfect time to announce her first pregnancy would be in US Weekly. Sure, some stars prefer Twitter to the traditional route of spilling the beans in a print publication, but to each their own. Alanis Morissette chose US Weekly’s 25 Things You Don’t Know About Me section to let the world in on her secret. Number 25 on Morissette’s answers was of course, “I am Pregnant.” Surprise! Many questioned whether or not the one-time angst-ridden singer would find true happiness after her previous failed relationships and broken engagement to Ryan Reynolds seemed to cloud her love life. Alanis Morissette dusted herself off and her music became lighter. So did her clothes and hair, for that matter. Morissette finally found her soul mate in rapper Souleye, aka Mario Treadway. The couple married in May of 2010 in their Los Angeles home. “We’re very excited to embark on this journey with each other,” the singer tweeted. If that baby’s pipes are anything like mom’s, watch out world.